The Navigation tool to the historical pages on this web site are at the top of this screen. The sites are "TLSN", "Sports", "Guest Writers", "missions", "articles" , "lost too soon", and "Sentry"
For information on Longhorn Women's basketball prior to 1973 Please click on the search Engine and type in "1896"
Much of the research for the history of Longhorn women's basketball was captured by Miriam Richards in 2012 as part of her Capstone project. The link to her site is in the credit section of the TLSN website. 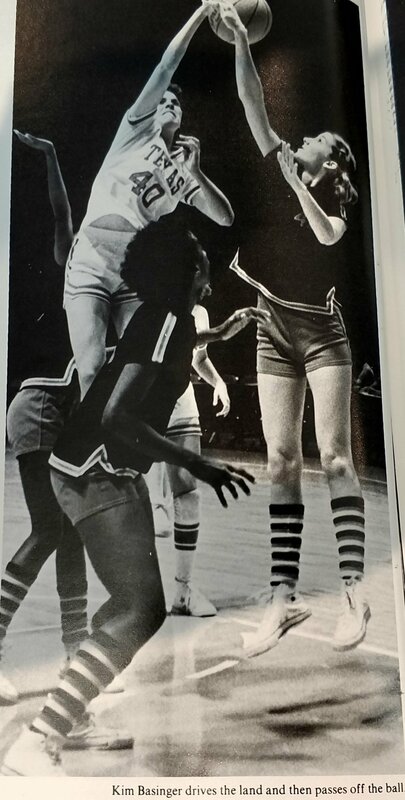 Full varsity intercollegiate competition in women's basketball began in 1974 with Head Coach Rodney Page. 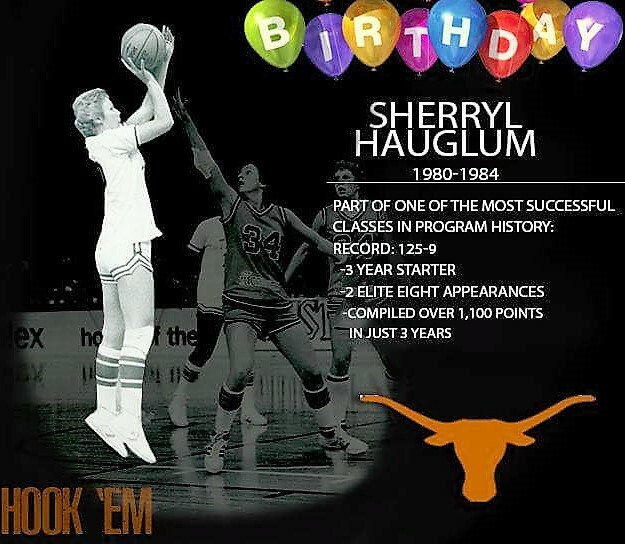 As of 2015, The Longhorns rank fifth in total victories and seventh in all-time win percentage among all NCAA Division I women's college basketball programs, with an all-time won-loss record of 1012–372 (.731). The Longhorns have won 22 total conference championships and 28 total appearances in the NCAA Tournament with 1 National Championship, 3 trips to the Final four, and 9 times to the Elite 8. As of March 28, 2016, Texas ranks fourteenth in all-time NCAA Tournament victories . When Coach Conradt is asked what is the major change she has witnessed during her coaching career in Texas she says "things that have changed, counting around the room, there are 11 media representatives here. If I could think back to when I first came here, if there were this many people in the stands, it meant someone's family was in town." 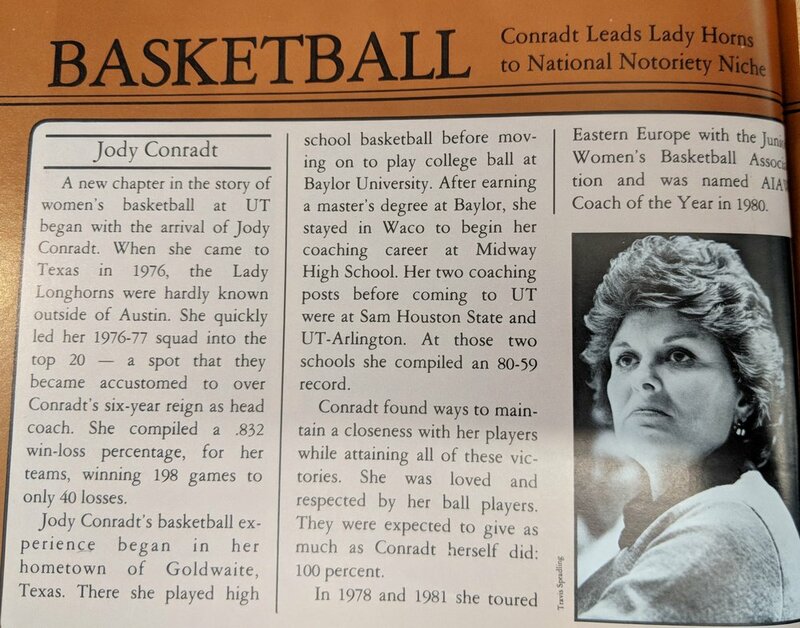 A tribute to Jody Conradt from Condellezza Rice is in the link below. Much of the research for the history of Longhorn women's basketball was captured by Miriam Richards in 2012 as part of her Capstone project and Tessa Nichols thesis in 2007. The first year's of women's basketball was to just staying alive. In order to save money on the First out of State game the team stayed with Lopiano's parents in Connecticut. Women's programs first game in the "Drum". Ranked #12 in the AIAW. South Zone champions. Linda Waggoner leads the way when the team lost two starters to injuries. National championship teams require good recruiting, a competent coaching staff, players with faith in the system, trust and respect from teammates, talent, team chemistry, a strong work ethic, and a little luck. With a little luck this team could have been a National Champion. Coach Conradt recruits players with speed to play a pressing and fast break offense. Linda Waggoner and Jackie Swaim lead the team to success. Tennessee humiliates the Horns 84-66 and settle for second place in the TAIWA tournament. Texas lost to Louisiana Tech at the AIAW playoff tournament. Linda Waggoner is chosen as one of the top 20 basketball athletes in the nation. 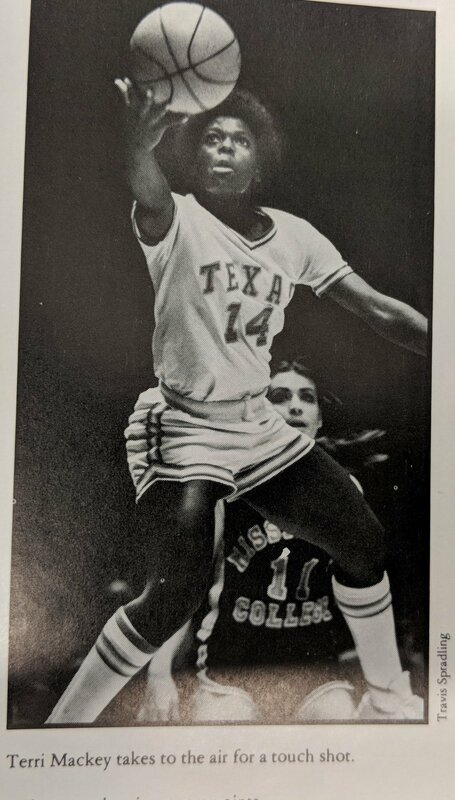 Retha Swindell , a 6-2 post, was the first black woman to play any sport at Texas and one of the first two All-American. She was recruited by Rodney Page who was the first black coach at Texas. Rodney Page is a contributor to the site, and tells her story in an article written in February 2019. She’s one of only five players to record 1,000 points and 1,000 rebounds in her UT career. As of 2018 her school records of 1,759 career rebounds and average of 11.6 rebounds per game still stands. She ranks 8th in all-time scoring. Coach Conradt says it was unusual in the 70’s to have a woman as tall and mobile as Rheta. The Horns had a great year but it was obvious that they were still not ready for big league basketball when the lost to Old Dominion 75-45. Texas did not win the state championship or a regional championship even though they had one of the best records in basketball . The Texas Women's Athletic department continues to wean itself from dependence on the the Men's program. Swaim is lost for the season due to injury. Old Dominion embarrasses Texas (75-45). Texas still has a long way to go to be part of elite College basketball. Conradt is AIAW Coach of the year. Team wins the State titled but lost the AIAW regionals to SFA again. Horns receive a at large bid to the AIAW Nationals but lose to Illinois State. Swaim had a school record 40 points against N.E. Louisiana. 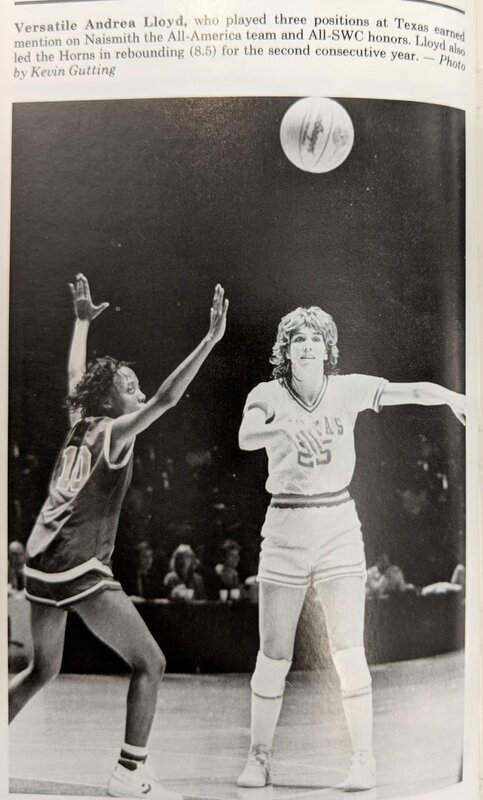 According to the book THE HISTORY OF TEXAS BASKETBALL by Richard Pennington, Coach Conradt and AD Donna Lopiano support the AIAW over the NCAA's bid for control of Women's college sports. Swaim recovered from her knee injury ask for hardship status and receives it. Since the inception of the AIAW the Longhorns are dominated in the state tournament by Stephen F. Austin and Wayland Baptist. This year that changes. For the first time in Texas Women's basketball history the whole Tower is burnt orange. Texas is eliminated by Illinois State in tournament play. This is the Last year for the AIAW. Paul Schnitt of the Austin American Statesman stated that the AIAW members included "the giant burnt orange steer against a bunch of foundering midgets." From 1977-1981 the Longhorns never made it past the regionals in the AIAW tournament, but in the final year of the AIAW Texas makes it to the finals. Carrying a 32 game win streak Texas loses to Rutgers in the championship game. In 1983 Conradt says this is her deepest and most talented team she has ever had. This was the first Longhorn to make the top 10. The Longhorns are 0-5 against Stephen F. Austin but in 1983 Texas finally breaks this streak to win 95-88. Annette Smith is the SWC Conference Player of the Year. Texas makes the NCAA tournament but Louisiana Tech ends the Longhorns 25 game winning streak . Ranked number one in the polls but they are eliminated in tournament play. 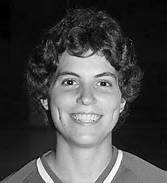 Fran played for coach Jody Conradt from 1982-86. 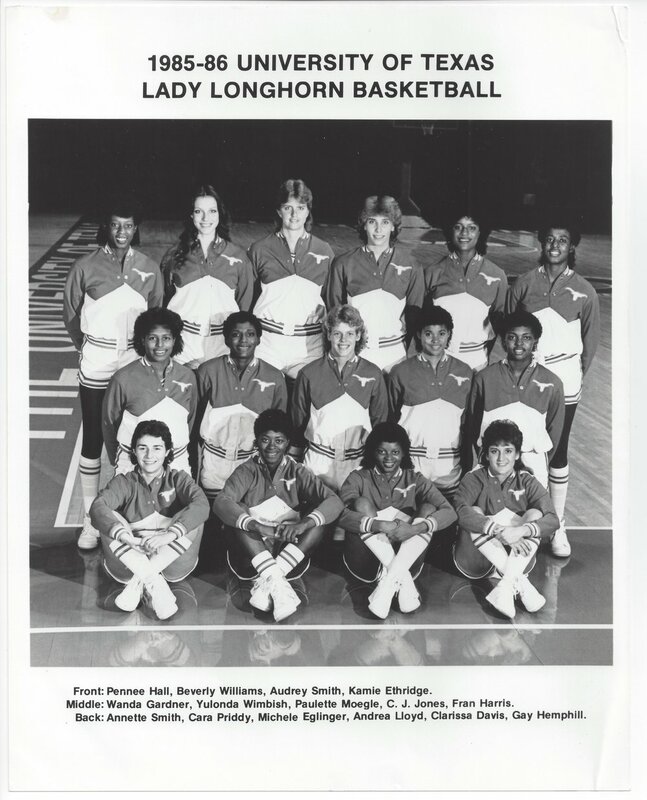 During her years as a Longhorn she was named Southwest Conference Player of the Year in 1984-85 and was team MVP of the national championship team. After college Harris played professional basketball in the WNBA, and for a Italian and Swiss team. After basketball she spent time with Procter & Gamble, as a broadcaster with ESPN , a host on HGTV Home Rules, Good Morning America, and as an adjunct professor at UT. In 2007, Harris was inducted to the UT Athletics Women’s Hall of Honor. 1984-1985- 28-3 record- ranked number one in the polls but eliminated by Western Kentucky in NCAA tournament play. Coach Conradt for the first time concedes that the lack of a challenges from SWC teams in conference play makes it difficult to be at the top of their game during NCAA tournament play. The Conradt basketball dynasty is featured in Sports Illustrated, USA Today, and The New York Times. NBC, ESPN, and CNN also did specials on the Horns. Much of the research for the history of Longhorn women's basketball was captured by Miriam Richards in 2012 as part of her Capstone project. Clarissa Davis scores 24 points to help the Longhorns win their first and only basketball championship 97- 81. "After No. 1 rankings and high expectations in their previous two seasons, the Longhorns finally capitalized against USC in the 1986 National Championship Game, making history in the process as the first team to go undefeated at 34-0." Georgia Coach Andy Landers on the 1986 Longhorns: "You could take their first five, mix them up with five high school players, take their second five, mix them up with five high school players, and you'd still have four teams probably good enough to be in the Top 10." "The first thought was perfection. Immediately after the USC game, it just hit me that we had accomplished something no other team had. There will be a champion crowned every year, but the undefeated championships will form an elite group." Average attendance for game sets a record of 5,289 per game. Texas is 98-0 in conference play since 1978. For the 3rd time Conradt is National Coach of the Year. With A Little Luck This Team Could Have Been A National Champion. Team makes the final 4 but loses to Louisiana Tech at Reunion Arena 79-75. Texas women played a tough schedule this year which included 13 teams that were in the NCAA tournament from the previous year plus the Russia national team. 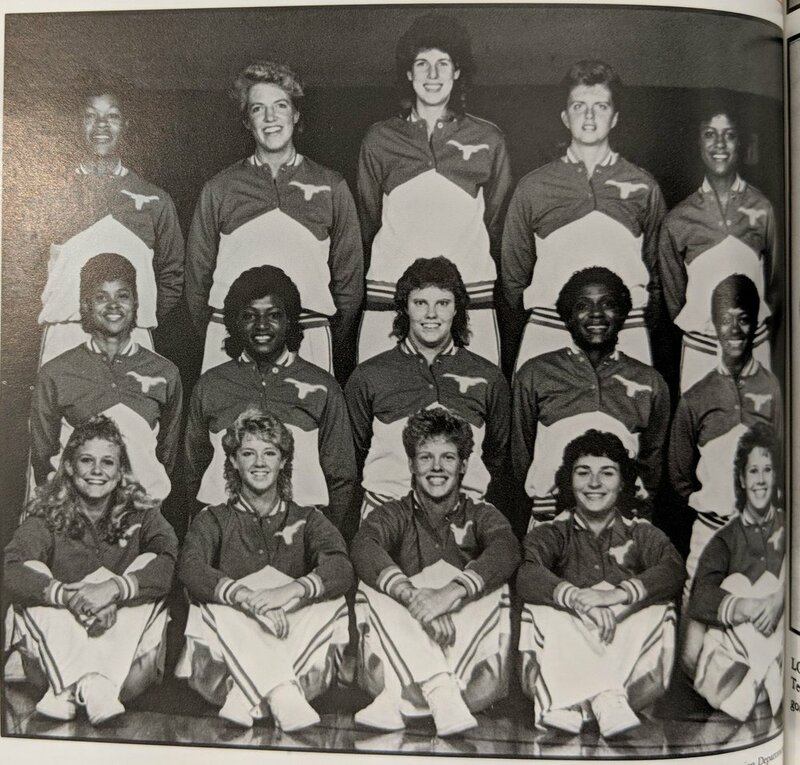 With A Little Luck This Team Could Have Been A National Champion..
Yolanda Wimbish Is The 1988 SWC Player Of The Year , an All-American, and She Is Inducted Into The Texas High School Basketball Hall Of Fame In 2001. Clarissa Davis has 45 points in a victory over Tennessee in front of a record crowd of 24,563 fans. A record for NCAA women's basketball. Clarissa has a season ending knee injury later in the year which hurts the teams chances of winning the national championship. Doretha Conwall was named MVP of the SWC tournament. Clarissa Davis returns and finishes her career as a 2 time National player of the year SWC Player of the Year and Wade Trophy winner. 183 game winning streak against the SWC teams ends. All of the losses during the year are to teams that made the NCAA tournament. Edna Campbell’s is the MVP for the SWC tournament. Classic Women's College Basketball - The last few moments of the 1989 NCAA West Regional Final between Maryland and Texas. The Terps held off Texas in Austin to move on to the Final Four. The quality is not so hot because it's from an old VHS tape. Edna Campbell and Vicki Hall lead the team this year. Susan Anderson also had a very good year. This is a year of first. First time Texas does not get past the first round of the NCAA tournament. First time in 9 years to finish second in the SWC. Most defeats in 13 years , and the lowest basketball ranking ever at # 16. Sheryl Swoopes signs with Texas but changes her mind and chooses Texas Tech. Edna Campbell Hall of Honor. Texas leads the nation in attendance for the 5th year in a row. Vicki Hall a senior All American is lost for the season. Conradt said this team did as well as they could under the circumstances. Nekeshia Henderson steps up and helps the team replace Vicki Hall. March 7, 1991 a 10 winning streak against SWC opponents ends with Texas Tech win 63-61. It was Tech's first win against the Longhorns in 37 tries. The Longhorn Critic proof program begins to fade and Critics start to question Coach Conradt's program. Dallas Morning News writes"Lady Longhorns baffled by decline of dominance". Austin American Statesman states "Slide from the Summit." Coach Conradt told the San Antonio Express-News " The Texas mystique is dead. We're just like anybody else now. Lamar beats Texas in the NCAA tournament. Vicki Hall has a devastating knee injury in 1991 so she receives another years scholarship. 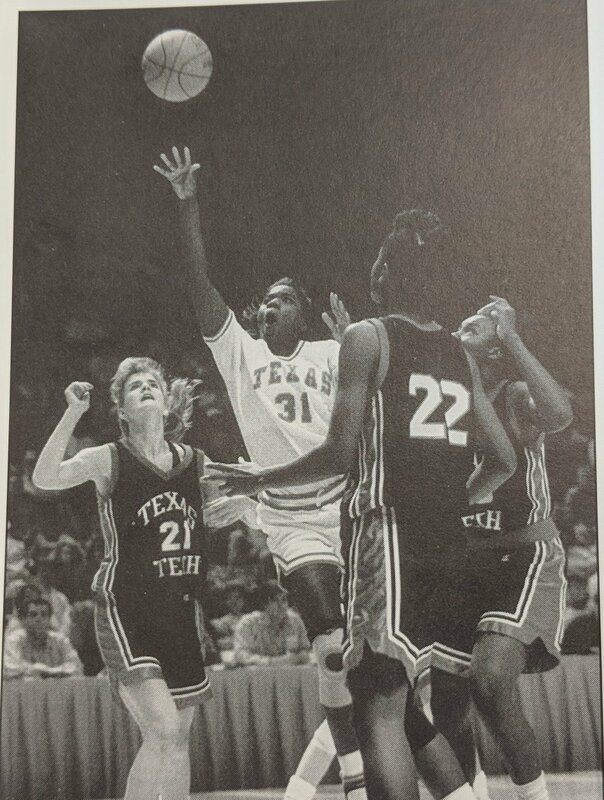 Playing with a brace in 1992 Vicki sets a career Longhorn women’s basketball record with 104 three point shots. Team loses to Louisiana Tech in the Midwest regionals. Texas drops out of the top 25 poll for the first time in 10 years. More derogatory articles are written about the direction of Coach Conradt’s program. Freshman year Danielle Viglione led the SWC in scoring and with the support of the NCAA and title IX women were on the way to equity legislation with the men’s athletic program. The preliminary NCAA plan required annual reports comparing the treatment of men’s and women’s sports programs. AD Lopiano resigns to join a Women's Sports Texas settles Title IX lawsuit and the UT administration starts the process of funding women's soccer, softball, and some other sports. For the first time in the history of the SWC there were no Longhorns on the all-conference team. 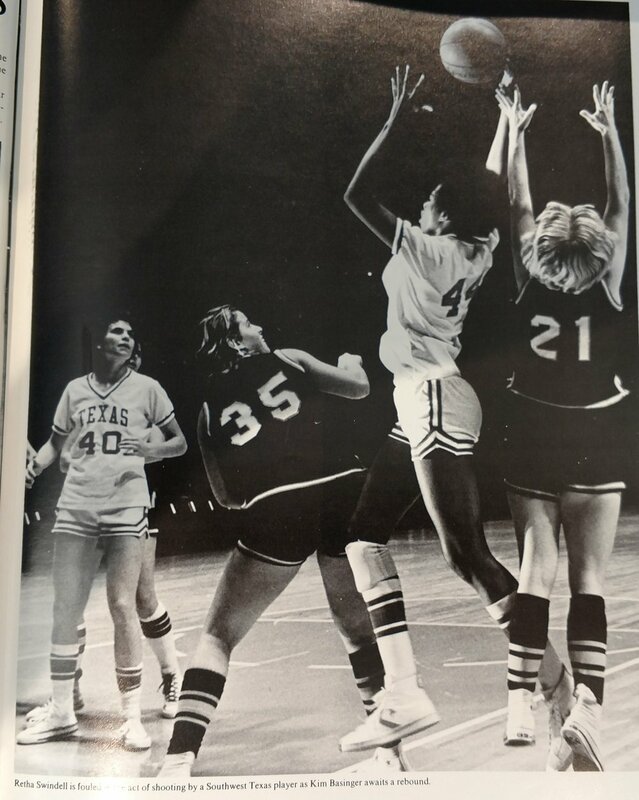 This was the first ever losing record and the first time since 1982 the Horns were not in the playoffs Amie Smith led the team in rebounding. It was an ugly year for the Horns, and the first time in 20 years that Texas did not get invited to a post season tournament. A much better year than 1995 but far from great. Randy Riggs from the Austin American Statesman says " the UT women had made more uphill climbs than Sir Edmund Hillary." Coach Conradt inducted into the Women's Sports Foundation Hall of Fame. The SWC members SMU, TCU, Rice, and Houston are not included in the new Big 12 conference. Conradt gets a $250,000 a year raise and extension until 2002. Team makes Final 4 but loses to Connecticut. 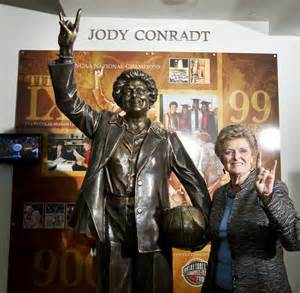 Texas' Jody Conradt is the second women's basketball coach to win 800 games. Conradt is 800-262 in 34 seasons, with one championship. 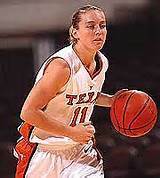 Stacy Stephens - 2000-04 A.A.
as Texas (12-4, 5-0 Big 12) snapped Tech's 15-game winning streak and stayed in first place in the conference. Coach Conradt won her last home game against Texas Tech. 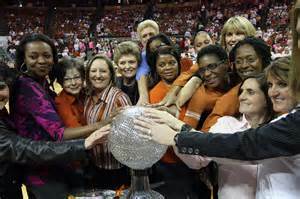 She coached the Longhorns for 31 years and successfully transitioned her teams from the AIAW, to the NCAA, SWC, and to the Big 12. Coach Conradt is one of the greatest basketball coaches of all time. In the mid-70s, when Coach Jody Conradt was building a winning women's basketball program at Texas, she spent $5 on a magazine that explained North Carolina coach Dean Smith's run-and-jump defense. Coach Conradt said "That became the defensive philosophy I've always tried to follow." Years later Coach Conradt joined Dean Smith in the small group of active Division I coaches who won 600 games. 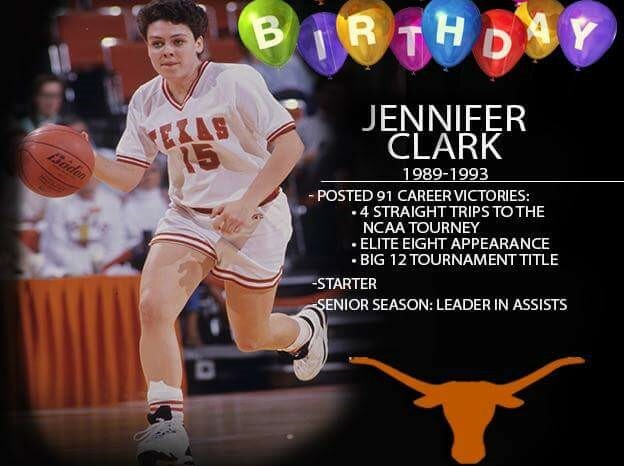 She was the first woman to reach that pinnacle in basketball when the Lady Longhorns beat Creighton 86-69. Coach Conradt is now the inspiration for many new coaches. 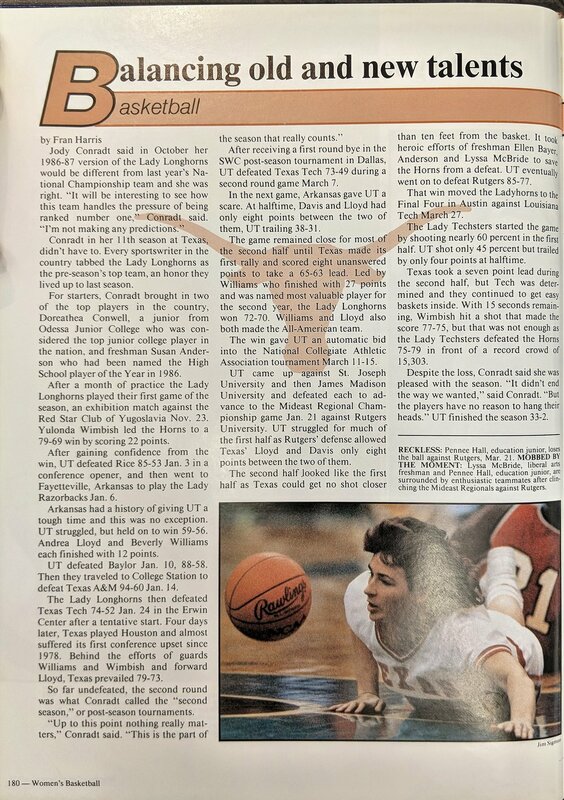 Arkansas women's coach John Sutherland, whose team ended Texas's remarkable streak of 183 conference victories in 1990, recalls the time the Lady Longhorns beat the Lady Razorbacks by 42 points in 1985. He asked Conradt to breakfast the next morning, looking for suggestions on how to improve his team. Conradt offered some and then said, "When you beat us...." Sutherland suggested that she meant if, not when. "She pointed a finger at me and said, 'When you beat us. You have to believe that first,' " says Sutherland. "I will never forget that. That was one of the most influential things anyone ever said to me in coaching. There are few people I respect in the game of basketball more than Jody Conradt." All coaches have to overcome nemesis, injuries, bad luck, and quirky plays to reach the pinnacle of success in college sports. For the Longhorns under Coach Conradt the nemesis was Louisiana Tech. Eight years the Longhorns were National Championship contenders and seven times the Longhorns lost to Louisiana Tech. If not for Louisiana Tech, the Longhorns would have more National Championship rings. Injuries also hurt national championship runs. 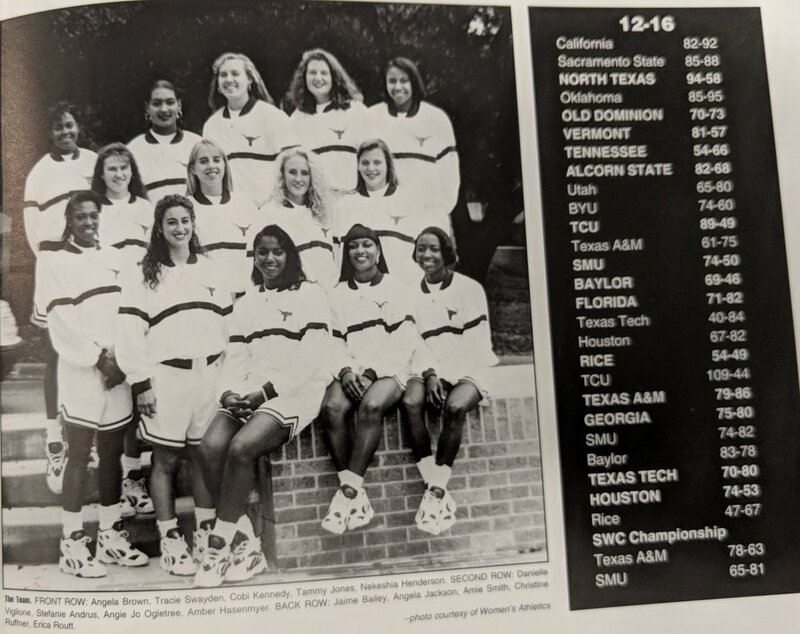 Texas winning momentum was thwarted several times by injuries to players including Jackie Swaim, Annette Smith, Yulonda Wimbish, Doreatha Conwell, Clarissa Davis, and Vicki Hall. even if the Longhorns had beaten Louisiana Tech 8 out of 8 years and Texas women had finished the seasons injury free, bad luck and quirky plays still derailed some Longhorn national championship runs. As I have said many times on this site, National championship teams require good recruiting, a competent coaching staff, players with faith in the system, trust, respect, talent, team chemistry, a strong work ethic, and a little luck.